MI6 has been watching you. They think you have what it takes. The world of espionage has changed and they need your help more than ever. Should you accept, you will receive your mission briefing including alias, target location and further classified information. Are you ready to enter a world of high stakes, sophistication and deception? Operate in the shadows or be in the heart of the action where the risks are great, but the rewards are greater. The time has come to find out if you have what it takes. Spend your evening sipping martinis while scoping out the casino or unravel the dark underworld of the most infamous criminal organisations. 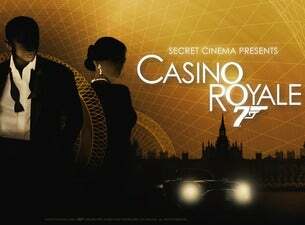 Witness the most memorable moments spill out of the screen and unfold around you as the night culminates in a unique screening of Casino Royale.